Today I was up and kicking at 0647. Have you ever noticed that the times I get up are so diverse? I mean I day I get up at 11:20 and the next day at 6:47. Isn’t it great? I can go to bed when I want to, get up when I want to, or just not get up at all. In Texas I could do that too, but only because I didn’t have a job the last year and a half that I was there. I would have liked it better to be going to work there. But, I’ll take this life here, it suits me just fine. I did nothing again today, but I do have some things to write about today. It will probably be as usual, I will think of one or two things more while I am typing, and I’m sure I’ll be able to stretch what I have into a decent post. Blah, blah, blah. Oh crap, I’m starting that already. I’ll try to limit my blah, blah, blah’s to two, and that was two, so I’m done with those. On to important things. 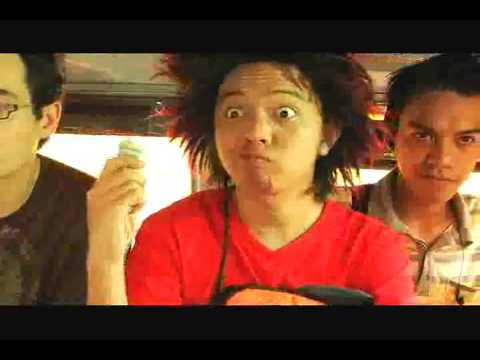 A funny look at How to Ride in a Jeepney. Lita left for the market this morning with Vicky about 0920. It was nice and quiet around here for about an hour or so. I only had two requests for ice candy, but our favorite customer didn’t show up today. Guess she couldn’t get any money today. I’m sure we’ll see her tomorrow though. She doesn’t go very long before she shows up. Lita didn’t buy anything for me at the market today, because I told her I didn’t need anything. I usually don’t, but she likes to ask, just in case. I think next trip, I’ll have her get some more chips. I’m out again. Some of the chips that they make here are pretty good. I don’t have to buy Doritoes or Lays chips all the time. There is one corn chips here that is BBQ flavored and I like it. The name of the BBQ one is Chippy. I’m looking at the empty package that’s in my trash next to the computer. There is also a cheese flavored one that’s good. It’s weird I think because I don’t eat the BBQ here and most of the cheese is nasty, at least to me. I was looking for some Corn Nuts a couple of months ago, but they never even heard of them here. Not one person in our Filipino family knew what I was talking about. I need to get some and let them try them. I think they’ll like them. I’d like to get them some trail mix too and some pecans. They didn’t know what a pecan was either. I’ll probably stock up on our visit to Texas. When we go to Korea in May I may be able to find some, because we will be going on Osan AB. We will stop by the commissary, BX and most certainly the NCO Club for supper. Maybe lunch too. The office at Malajog Beach. This is what passes for a dog around here. I just took a long break…about 2 hours. I was talking to Titing and we were spending the money we won at the lottery. All P277,000,000 of it. We were talking about all the things we could buy in the States with the money and traveling there on a first class flight. That’s almost $7 million so we were having a good time. But Lita came to get me and burst our bubble by reminding us that we forgot we had to win the money before we spend it. Oh well, maybe tomorrow. I also talked to Titing about our little trip to Cebu. He said that for him and Neneng, they would need at least P10,000 ($250), and he hopes that they can save that before then. He has all his taxes to pay in January, so it could be difficult to do. That $250 is for 2 days and 1 night (at a hotel) and eating at the Jungle Restaurant getting the steak he wants. Plus any other activities we may decide to do. I figure that if he can make it on P10,000, then Lita and I could do it too, so we will try to save that amount. If we can’t do it, then we might have to wait until June, because that will be the first month after the big Pepsi truck is paid off and we will each be getting an extra P10,000 per month. We can only wait and see and hope for the best. Of course we’ll (Lita and I) be going to Korea with Jaclyn and family in May of next year, so I’ll be getting a steak before he does at the Osan NCO club. For Titing and Neneng though, even after we get back from Korea in May, we would still make the trip to Cebu, so they will be able to have their days off too. They work way too much. As do most Filipinos, but I came up with the idea of Cebu for them to enjoy themselves. We were just going along for the ride. We’ll see. I’ll keep you up to date, of course. Marianne digging in the ice candy cooler. I now have a total of 3 blogs. The other 2 will be updated monthly. They are both basically the same except on one you get my opinion of a subject and the other you get my opinion of someone’s else opinion. Actually the second one is really like a combination of my opinion and my opinion of their opinion. If it gets off the ground, then it will generate traffic for someone else’s website and maybe they will try to send some my way too. Lynn was outside on the picnic table peeling cassaba today. They make some kind of cake out of that to sell and to eat. I’ve never tasted it, but I may someday, in case I like it. I’m not big on trying new foods, in case I haven’t mentioned that before. Every once in a while though, I’ll take a chance. I usually regret it, but sometimes it turns out alright. I noticed that recently the amount of spam coming to the blog has decreased. There was only 4 on there for about 4 days. Maybe the worst of that is over. I guess, no, I hope that all those times I clicked on “Delete Permanently” is finally paying off. It was really getting tiresome. I sent out ‘requests’ today to some of my relatives and friends and asked them if they would put my blog on their Facebook account. Ramil gave me the idea when he said he put it on his. I already have it on mine, but for some reason I didn’t think to ask anyone else. I don’t know if it’ll do any good, but it might. Remember yesterday I was talking about “The Top Blogs in the Philippines”? Well I made a small error on that. We were not #543 out of all the blogs in the Philippines on that list. We were #543 out of the “Personal” blogs on that site. Well I looked today 3 times and here are the times and what position we were at: 0650 (#525), 0920 (#514) and 6:38pm (502). That’s when I figured out my error. So I did check to see what number we were among ALL blogs on that site and we were #2464 of 6393. Let me go check it again right quick to see if it has changed. Oh crap, we’re losing ground: Personal (#504), Overall (#2481). We need to get new people reading this thing to move up. We only had 8 unique readers today, so far. Oh wait, we’re not losing ground really. In Personal the total went up from 1502 this morning to 1511 now. Overall it went up from 6393 to 6426. Figuring it out, percentage wise, we are still in the top 34% on Personal and top 39% Overall. It was exactly the same this morning, but we still have to get more readers because if the blogs keep increasing and our readers don’t, we will begin to fall. Tagalog word of the day: tinidor (ti-ni-door) means fork. I’ve come to the end of my topics again. Let’s see if I can think of at least one more to put here. I just had a message come on my computer for incoming mail. I haven’t look at it yet, but the subject was for a site I found from my little hometown back in Texas. I found a place on there that you could publish a little story and it just came back approved. The name of the site is: ILoveBelton.com. There wasn’t very much on the site but I figured since it was free, I’d put a little story about our move over here to the Philippines, you know, who and why. I also left my blog site URL there, in case someone wanted to check it out. Hey, I’ll take a chance on getting hits wherever I can. I just helped close up the BBQ for the evening. Vicky and Lynn left about 15 minutes ago. It’s 11:25pm now. I have to put the tricycle and the 2 benches in every night. I also move the BBQ pit and the little fence/gate Arnel made out of the way. Then lastly I close the window they use to order at and turn off the light in the BBQ area. We tried closing up tight so the dogs wouldn’t get in, but one of those dogs can jump the about 5 1/2 foot fence, so as long as he can do that, he’s getting in. We will just have to weigh down the trash so he can’t dump it over. This kid, I don't really know his name, is a very good massager. Reverof and his broken arm. Emilio Aguinaldo lost to Manuel L. Quezon in the country’s first presidential elections in 1935. Bagumbayan was the original name of Luneta Park. The Philippines is home to some of the world’s most exotic birds. One of the most endangered species is the exotic Kalangay or the Philippine cockatoo (Cacatua haematuropygia), which belongs to Psittacidae or the family of parrots. Some cockatoos can live up to 50 years. They are known for mimicking human voices. Most of them measure 33 centimeters in length and weigh 0.29 kilogram. uj I am the closest one….may be a big share for me.hahahahaha! Your not the closest, your in Manila. I’ll give it to Cathy and Titing and skip over your house until you return. Or maybe while I’m hugging Robbie to keep her warm, I’ll give her some pesos. jk dude. May? I thought they were coming in June, I got mixed up there. Cassava cake! My favorite. Best of all cooked Filipino sweet snacks as far as I’m concerned. I’ll try that Cassava cake. If Jaclyn is going to Korea with us, they need to come in May. Our one year is up on May 17th. So around the beginning of May, we are going to Korea for a couple of days. Jaclyn wanted to go shopping there instead of Manila. That’s why we probably now will pick them up at Tacloban instead of Manila. It’s all in the posts somewhere. You need to get caught up. I know you’ve been busy, but I thought you were up to date. Now that you mention it, I have never seen corn nuts here either. If I remember (and you can remind me), I will add some varieties to my bags when I return in April. Trail mix is always good too. I remember trying to find pecans here and even when we were in Thailand but we could not find them in either place. I like cassava cake. Last week, we tried twice to buy some when we were leaving Calbayog and heading north. There is a little road side stand where you drive up, order the cake and away you go. Alas, they did not have any for sale either time. So, if you won the 277 million lottery, would you stay in the Philippines or head back to the States? I have pondered that question myself and I still don’t have an answer. I think I would stay here, travel a lot and maybe fly first class to the States every other month to buy food and things that I can ship back. You would never run out of jerky! Well I hope I’ll have some (corn nuts, trail mix and pecans) in April and whenever my “care package” arrives. P277 million. What’ that, a little over $6,500,000? How much of that do you pay in taxes? In Texas it’s 28% I believe, so going by that rate, I’d have $4,680,000 left. I’d have to share with the folks in TEXAS. I always told them that I’d take half and split the other half among them. Give them about $450,000 each (x5), so $2,250,000 from $4,680.000 is $2,430,000. Then I have the Filipino relatives. Give them between P100,000 and P1,000,000 each, depending on how close a relative they are. I’d still have over $2,000,000 left. I think I’d do the same as you except maybe to the States every 3 months. It’s a long haul over there, but maybe in 1st class it wouldn’t seem so bad. Nice dream huh?